The growing amount of fast-moving space debris orbiting the Earth could lead to catastrophic collisions with satellites, hurting economies, researchers warned Wednesday ahead of a summit to coordinate efforts to remove the junk. There are an estimated 170 million pieces of so-called "space junk"—left behind after missions that can be as big as spent rocket stages or as small as paint flakes—in orbit alongside some US$700 billion of space infrastructure. But only 22,000 are tracked, and with the fragments able to travel at speeds above 27,000kmh (16,777 mph), even tiny pieces could seriously damage or destroy satellites. 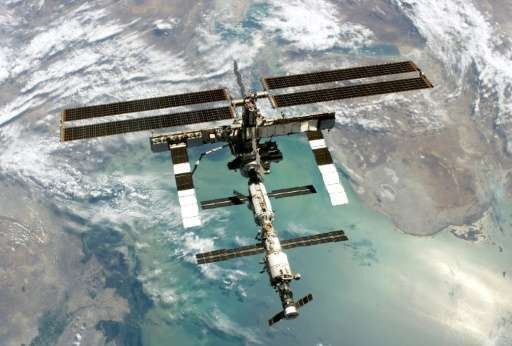 "The space junk problem has been getting worse every year," Ben Greene, head of Australia's Space Environment Research Centre which is hosting the two-day conference of international space environment scientists in Canberra, told AFP. "We're losing three or four satellites a year now to space debris collision. We're very close, NASA estimates, of within five to 10 years of losing everything." Greene added in a statement that "a catastrophic avalanche of collisions which could quickly destroy all orbiting satellites is now possible", noting that more collisions were creating extra debris. With society heavily dependent on satellites for communication and navigation, and powering key industries such as transport, finance and energy, the growing cosmic junkyard could threaten economies. "The Australian economy is entirely dependent on space," Greene said. "We're a big country with few people and the only way we can service it, whether it's with surveillance, safety or search-and-rescue, is from space." The barriers to entry for building spacecraft were also falling, making it easier for firms to launch their own objects, said space debris expert Moriba Jah from the University of Texas, who is at the conference. "I believe that we are certainly on a path to what I call a tragedy of the commons," he told the Australian Broadcasting Corporation, adding that a major collision was "inevitable" without action to tackle the problem. "You've driven on the roads here when you have a lot of mist or fog, and you have to go really slow, and you just don't know what's really around you. That's the perfect analogy to space right now," Jah said. Greene said scientists were developing technologies set to be operational in 18 months to track all debris so spacecraft could move around them. Another idea in the works was Earth-based high-powered lasers that could be fired into space to "push the debris around a little bit", with the programme 75 percent ready, he added. An experimental Japanese mission to clear space junk using an electrodynamic 'tether' to slow down the orbiting rubbish and bring it into a lower orbit ended in failure in February. where is Richard Benjamin and QUARK when you really need him??!?! -A better idea... a general purpose multi-km-square PV array which could immediately begin earning its keep by nudging garbage out of orbit. Simultaneously it could beam power back to earth and to a growing orbital station community. And farther on down the line it could provide beamed propulsion to inner system craft. Being a private commercial endeavor would assuage fears that it was meant to be a weapon. I am sure it is already on Musks list. Otto, the building of said PV array would add a lot of space junk just in launching the materials up to do the building, let alone anything lost or ejected by said workers in the environment, who would also be at risk for impact with space junk. I remember back when they were worried about 'Hundreds of pieces of skyjunk', let alone a couple hundred million of them. I see. So we should continue to put all the 1000s of things in orbit that we are going to do, except for the one thing we can use to clean it all up? Including the debris that constructing it might create? Did you see the new huge white plane for putting yet more stuff in orbit? Yes, we should continue putting stuff up there and hope it cleans itself up. Orbital power platforms will be up there along with all that other stuff. And they will be paying for themselves by taking govt money to deorbit space junk.